Some catalytic oxidizers have a limited ability to process a wide range of concentrations. 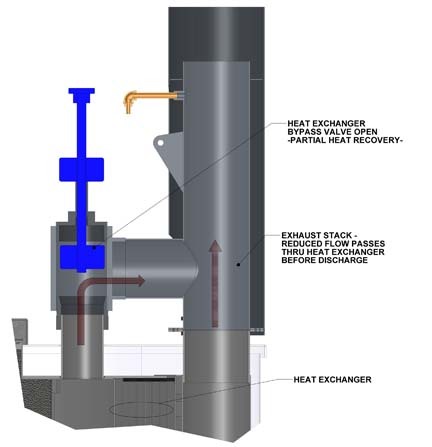 Poor designs, inefficient non-adjustable heat exchangers and imprecise vapor control limit an oxidizers ability to accommodate varying concentrations. Catalytic oxidizers that are properly designed recover significant combustion heat and use it to preheat the incoming flow. FALCO catalytic oxidizers are supplied with efficient heat exchangers. When comparing heat transfer rate per unit surface area, the counter flow designs used in the FALCO 300 and FALCO 600 heat exchangers are more efficient than the cross flow designs used by other manufacturers. 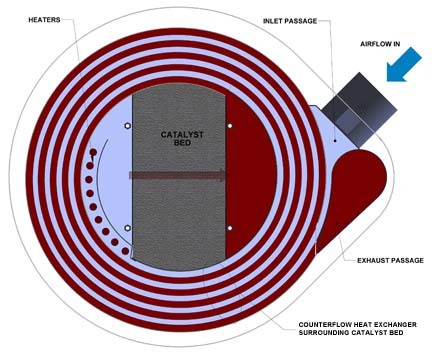 The FALCO 300 and FALCO 600 heat exchangers surround a centrally located catalyst bed. This orientation is superior for heat recovery and minimizes conductive heat losses by placing the hot region in the interior while the cool ends of the heat exchange circuits are at the outer surface. The operator should be able to adjust an oxidizer to operate efficiently over a wide range of concentrations. FALCO catalytic oxidizers include heat exchanger bypass valves which allow adjustment of heat recovery. When operating at medium to low input concentrations, the bypass valve is closed. This maximizes heat recovery and minimizes the need for supplementary electric heat. When operating at 300 scfm and 785 ppmv gasoline vapor input, the FALCO 300 heat exchanger heats incoming vapor to reactive temperature without added electric heat. As input concentration declines from 785 ppmv, heater load gradually increases. At very low input concentration heater load is about 13 kW. Note: Regardless of bypass adjustment, all flow passes through the catalyst and is treated. With high source vapor concentration, the heat exchanger bypass valve is opened to reduce heat recovery. Reduced heat recovery enables the VCV to automatically maintain concentrations up to approximately 2,200 ppmv. This adjustment maximizes recovery rate. High heat exchange efficiency enables operation at low vapor concentration with minimal power use. The FALCO 300’s patented spiral plate heat exchanger is 73% efficient at 300 scfm, and this provides huge cost savings over the life of a project. Click here for FALCO 300 Energy use calculator. For example: A FALCO 300 catalytic oxidizer operating at 600 ppmv (Gasoline) and 300 scfm will have a heater load of 3.04 kW. At 10 cents/kW hour the power cost is $2,667/year. 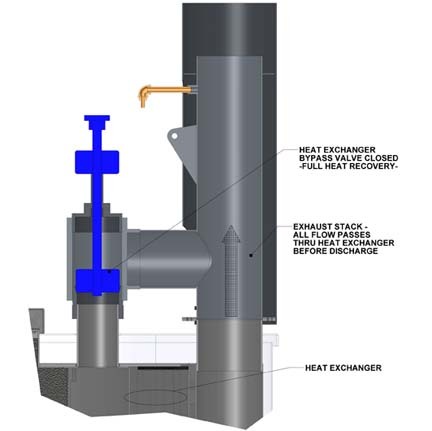 Under the same conditions, an oxidizer with a heat exchanger that is only 50% efficient would have a heater load of 17.16 kW. The operating cost would then be about $15,000/year. $12,300/year more! Falmouth Products is the only company that manufactures its own Vapor Control Valve (VCV) specifically designed for Soil Vapor Extraction. The VCV enables the FALCO 300 to start up, operate automatically, and precisely regulate input vapors. The VCV allows automatic restart capability in the event of power interruption, minimizing down time. The VCV minimizes power use by maintaining and automatically maximizing input concentrations. Each time the FALCO heater comes on to preheat the incoming flow the VCV introduces more source vapors and reduces dilution air. This saves money! Efficient heat exchangers and precise vapor control allow FALCO oxidizers to efficiently treat a wide range of vapor concentrations.